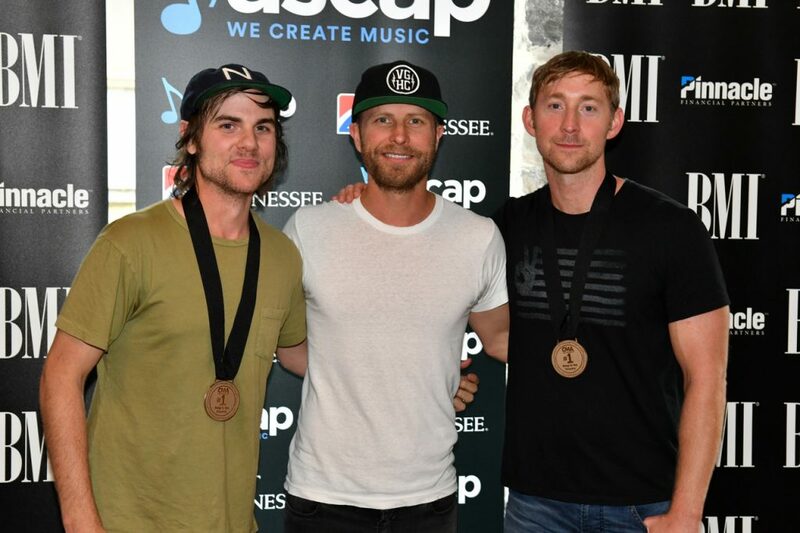 ASCAP’s Mike Sistad kicked off the celebration to honor Bentley and his co-writers Ross Copperman and Ashley Gorley. Produced by Copperman and Arturo Buenahora, “Black” is the third consecutive No. 1 song off Bentley’s latest album with the same name. “One of the things I’m most proud about this song is that working with Ross, obviously he’s a songwriter and we write a lot together, but the six songs that came before this were ones that none of them had our names on them together. This is the first song we’ve put out that actually we wrote together, and that’s something I think the three of us all take a little bit of pride in, that we’re just trying to find the best songs…whether we wrote them or not,” boasted Bentley. ASCAP’s Beth Brinker honored Gorley, who celebrated his 33rd No. 1 hit. Gorley was the 2016 recipient of ASCAP’s Country Songwriter of the Year award. The Warner/Chappell writer was also honored last year as the first songwriter ever to receive three CMA Triple Play Awards, each of which celebrates writers who pen three No. 1 hits in a 12-month period. Sony/ATV’s Josh Van Valkenburg, Combustion Music’s Kenley Flynn, Warner/Chappell’s BJ Hill, and Kobalt Music’s Jesse Willoughby were also on hand to remark on Gorley’s writing achievements. BMI’s MaryAnn Keen honored their 2016 Songwriter of the Year recipient Copperman, who also won ACM’s 2016 Songwriter of the Year award as well as a CMA Double Triple Play Award for penning six No. 1 songs in a 12-month period. This is Copperman’s 16th No. 1 song. “I feel so honored to be a part of this project. Thank you Arturo for bringing me into this world. Thank you to these guys for writing with me, and trusting in me, and being my best friends,” Copperman said. Pinnacle Bank’s Cooper Samuels congratulated the writers and celebrated with a charitable contribution made to the Monroe Carell Jr. Children’s Hospital in each of their names. CMA’s Brandi Simms presented the writers, who have 13 Triple Play Awards between them, with their No. 1 medallions.